I have a bit of a confession. I don’t like drinking milkshakes. Somewhere along the way, I drank too many, got the worst stomach ache and that memory has continued to haunt the deep recesses of my mind. 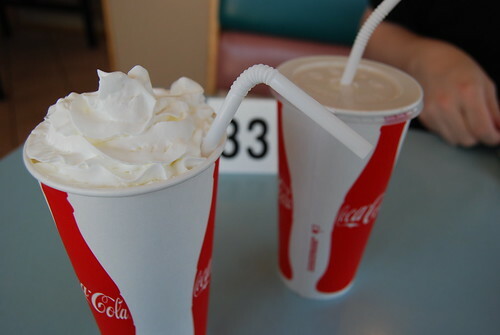 Additionally, milkshakes are high calorie with not enough of a satisfying payback. Why get a milkshake when I can have ice cream instead? But when it comes one particular milkshake, all that reasoning goes out the window. 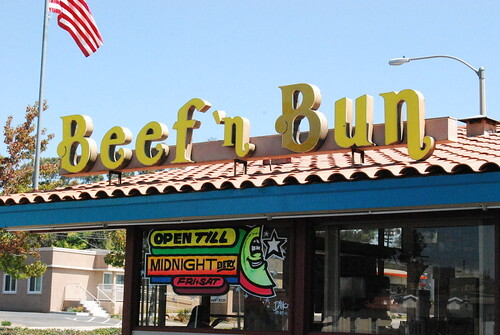 Beef ‘N Bun Whistle Stop is located in El Cajon right off Fletcher Parkway. I wouldn’t normally go that far out of my way for a milkshake but it’s that good. Plus the name Beef ‘N Bun? What’s not to love about that?? Sure it’s a bit hokey but I enjoy the quaintness of it all. 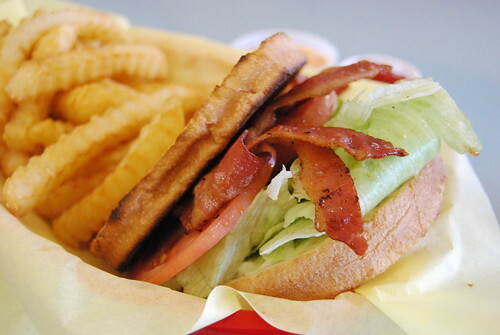 Beef ‘N Bun is a bit of an old school restaurant and an institution in El Cajon. College kids stop by after class, Saturdays are busy with parents treating their kids to lunch after a soccer game — it’s that type of place — always buzzing and always busy. But it’s the shakes that keep people coming back for more regardless if they live in the area or not. While best shake flavor is disputable, what’s not is how consistently good they are here. Thick, huge servings (a small shake is easily more than 16 ounces), full of frosty flavor and piled high with whipped cream. A small goes for $2.96 while a large is $3.45. Milkshakes of the month are also available but no flavor was assigned for April. The peanut butter shake I ordered had wisps of real peanut butter swirled in with vanilla ice cream, as evidenced by the slight dab of peanut butter still at the lip of the cup when I received it. It’s nothing to look at with the opaque cup it’s served in but this is Beef ‘N Bun after all. While shakes are not everybody’s thing– nor should anyone indulge in them regularly– they have equally good freezes ($2.95). A mix of your choice of soda (Coke, orange, Mr. Pibb, root beer, lemonade, raspberry iced tea) with vanilla soft serve and the entire concoction is blended until fully combined. Their sandwiches are hit and miss (the fish sandwich is ‘eh’ -P.H. ), although I would recommend the BLT sandwich special to help buffer the effects of absorbing too much sugar from their shakes. 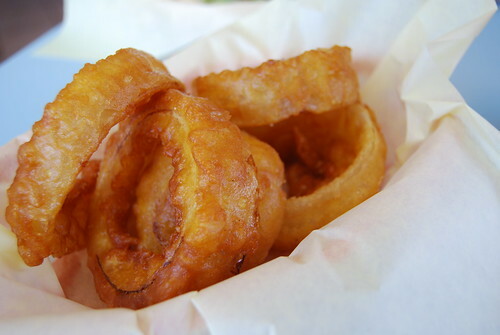 As for fried delights, onion rings are freshly battered and fried up upon order. Entire zucchini spears are battered and fried — no wimpy nuggets here. The only complaint is the lack of seasoning in the batter. A drive-thru is available but considering the time it take to whip up one of their food, it’s best to go in and absorb the ambiance that is Beef ‘N Bun. But take note not to take any photos inside— the manager may just give you stinkeye. Oh, I’m drooling! I think a trip to El Cajon is in order this afternoon. The PB shakes at Beef & Bun are absolutely divine. Oooo! Beef N Bun and Fred’s controversy! Who knew? I have yet to go to Fred’s especially after reading your account of their massive burgers. great photo of the exterior! gotta love that name! i’ve never heard of this place but then again, i don’t really go that far east in el cajon. i know my husband would love that pb shake! great post – makes me want to go there now – it’s so damn hot! Yeah, what happened to spring? This weather is too hot for me. It’s actually really good shave ice weather too. If it’s hot where you live, it’s about 10 degrees warmer in El Cajon because it’s so far inland. This is so far away from us, that it took us three freeways to get there! If I went to school close to Beef N Bun, I would regularly visit as well regardless of weather too! Oh MY! I can’t believe this. My boys grew up with Beef ‘n Bun! My youngest used to twist my arm to drive over for an after school treat when we lived in East County. It’s been a while. And you are so right. 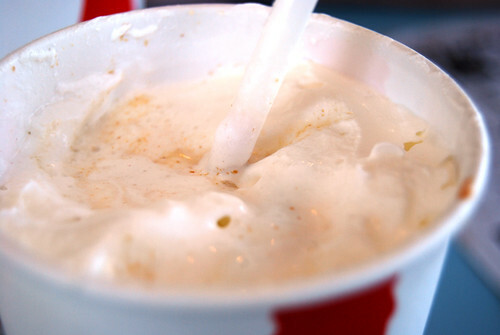 The milkshakes are addicting — so many great flavors, too. I may have to tempt my husband with this one. It won’t take long 🙂 Thanks for the reminder. Just went to had my first Beef ‘n’ Bun shake. It really is very good! Probably the best I’ve had in SD and I had it after eating the spiciest Thai drunken fried rice EVER. It was perfect. Good thing we went at night or else I would have taken a picture. 😉 The man who took our order was really nice. Ok, I meant to say “Just had my first…” or “Just went to Beef ‘n’ Bun…” and somehow they were jumbled together. Today is not my day. I need to try that combo: spicy Thai followed by a milkshake. Sounds like a perfect after dinner treat. Wow this was a great post to click on beacuse I live a hour away from El Cajon. 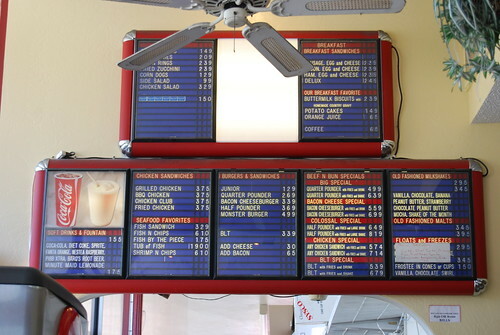 I agree with everyone else here…my mouth is drooling from the description of those shakes. Thanks for sharing this great spot. I will have to check it out when I get some free time. 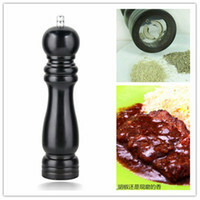 take care and nice blog by the way! The banana shake. The fried zucchini. At breakfast, the potato cakes. All addicting. Love it here. Good to know about the potato pancake! I know I will definitely return, potato pancake or not.